* You can pay through PayPal with a credit or debit card. You do not need to open a PayPal account. * We will add £1.50 P&P per item. “Onward Ever”: the motto of Sir Henry Bessemer is fitting for a man who displayed phenomenal energy, creativity and invention throughout his life. Bessemer (1813-98) was a self-educated inventor. In large part, his converter and steel-making process sparked the industrial revolution. They created the durable steel needed for bridges, buildings and railways. 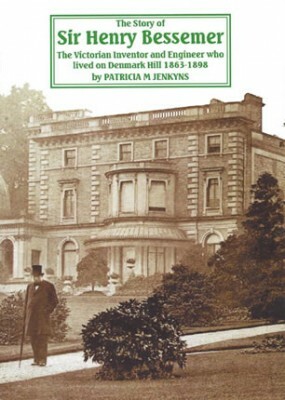 To mark his 200th anniversary year, the Herne Hill Society published a revised biography of Bessemer, with extensive material on the house and estate on Denmark Hill where he lived for the last 35 years of his remarkable life. At the 2013 Walter Bor Media Awards for local history publications, this book was ‘commended’. The book is such a professional presentation, and the photographs and images work so very well. The additional material, including the references to Mushet, Göransson and Gilchrist Thomas, and details of Bessemer House and Grange and their history, are so well researched and written. I had yet to see a picture of Hillcrest Lodge! The expanded section on SS Bessemer is also very impressive, and it was fascinating to see a picture of the saloon on location at Swanley. Many congratulations! The Story of Sir Henry Bessemer is available direct from us, or from Herne Hill Books in Railton Road, London SE24.